Waiting for a check at a restaurant may soon become a thing of the past, as online reservation giant OpenTable has begun testing its own mobile payments system, allowing diners to settle their tab directly from their iPhone. The new system, said to be based on technology developed by recent OpenTable acquisition JustChalo, is expected to launch in San Francisco by the end of 2013 and expand to additional cities later if the program proves successful, according to The New York Times. It's planned to be directly integrated into OpenTable's existing free application for Apple's iPhone. OpenTable's focus is on simplicity and ease-of-use, as Chief Executive Matthew Roberts explained that no "geeky stuff," such as scanning barcodes, will be required to use the service. And in a nod to restauranteurs who have long complained about the company's high fees, OpenTable has reportedly elected not to add additional charges, instead allowing restaurants to pay only typical credit card processing rates. Paying with a smartphone is not a new idea, with companies like Square and Google offering digital wallet services for years, but adoption among restaurants has been slow. OpenTable's entry into the market could give the concept a significant boost, as the company already provides reservation and table management services to more than 28,000 restaurants throughout the world. OpenTable's payment system will debut in San Francisco this year, with expansion planned to other cities if the program is successful. There is no word on how the new system would fare alongside Apple's existing In-App Purchase program. Apple generally refuses to allow competitive payment offerings in its App Store, famously rebuffing Amazon's attempt to allow users to purchase books directly via Amazon's Kindle app. However, Apple and OpenTable have a history of close collaboration, as OpenTable's services are behind the restaurant reservation ability built in to Siri. OpenTable's move could be seen as a defensive tactic as competition in the online reservations space heats up. Just this month, Groupon launched Reserve, a competing restaurant reservation service packaged with discount offers, in 600 restaurants found in the company's top 10 markets: Atlanta, Boston, Chicago, Denver, Los Angeles, Miami, New York, Philadelphia, San Francisco, and Washington D.C.
OpenTable took one competitor out of the picture this week by acquiring Urbanspoon's Rezbook system, which launched in 2010 in an effort to allow restaurants a cheaper way to set up an online reservation system. 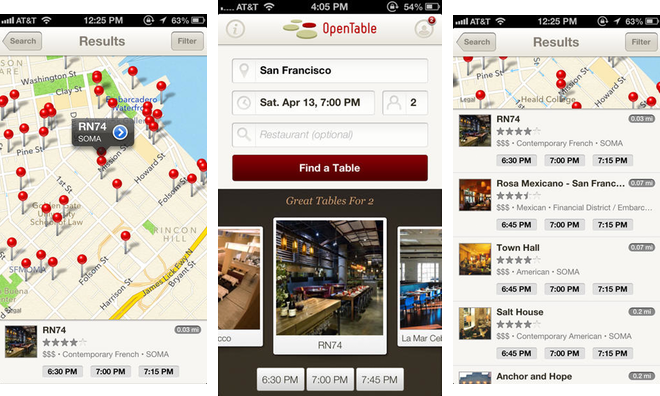 The deal will also see OpenTable powering the IAC/InterActiveCorp company's reservation service.